Keep your clubs and shoes in course-ready condition at all times with the Callaway® multi-purpose club/shoe brush. Safely intended for use on both clubs and shoes, this brush features soft and hard nylon bristles to help remove dirt and grass from a variety of surfaces. 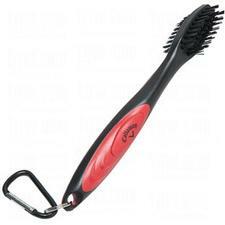 The ergonomically designed handle keeps your hand comfortable during use, while an included carabiner clip easily attaches to your golf bag when the brush is not in use. If you have any more questions about the Callaway Golf Club Cleaning Brush (Includes hard & soft nylon brush); do not see the model you are looking for; need custom options; or prefer to not purchase online, then please call us at (630) 656-1291.